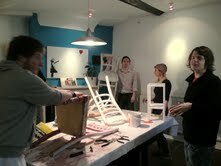 Upcycling workshop is going really well, currently have almost three items ready for sale. Two young people spent time doing up old bird cages which have already been sold. Spent some time a few weeks ago with Beck from Y.Art learning how to screen print material. We will be using this to print our own fabric for upholstering furniture but also for personalised canvas, bags and t-shirts etc.